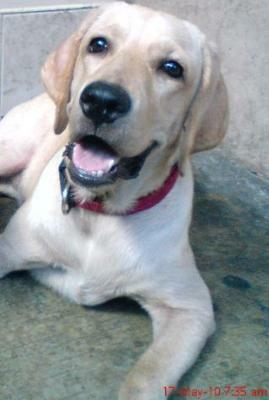 We have a 2-year-old female Labrador. She's very active and friendly. The problem is last year we noticed blood in her urine. She also frequently urinates in a small amount, and have difficulty each time she tries to pee. We also noticed that she has not been eating a lot lately and sheds off some pounds. Our yellow Labrador also drinks a lot of water more often. We've been giving her Vit. C tablets. I would like to ask for opinion regarding the situation of our dog and what's the best step forward. A number of different conditions could cause the symptoms you describe, the most common of which would be a urinary tract infection. You will need to make an appointment with your veterinarian to determine if this is indeed what is going on. The doctor will need to perform a physical examination, a urinalysis, and perhaps some other tests before making a definitive diagnosis and prescribing appropriate treatment (antibiotics if an infection is involved). I am concerned that this problem has been going on for long enough that your dog has lost weight. Infections that start out in the bladder can eventually reach the kidneys where they are much more dangerous. Also, other serious conditions (for example, bladder stones) can cause symptoms similar to infections, so it is very important that your dog see a veterinarian as soon as possible.